If you are an eligible business you can have your business added to the GBDG business directory for FREE. If your business is a mobile service or home-based business, you can join the GBDG for an annual fee, giving you access to all GBDG member services, including the addition of your business to the directory. Fill in the form below and we will get in touch to discuss membership options and how the GBDG can benefit your business. Additional Information - If you have any questions, comments, or want to tell us more about your business, enter it here,. Workskil Australia is a national not-for-profit organisation, with over 30 proud years of supporting Australians to achieve sustained economic and social self-reliance. We do this by providing a range of employment, work experience, disability, youth, Indigenous and health services across New South Wales, South Australia and Victoria. We work hard every day to: Provide quality employment and community services to people seeking work. Provide specialist employment and community services to young people, people with mental illness, people with a disability and Indigenous Australians. Meet the labour needs of business and industry through quality recruitment services; and Delivery quality work experience projects across to the community. National Pharmacies Optical has been passionate about the optical care and eye health of our members since the opening of the first National Pharmacies Optical store in 1990. That’s over 25 years dedicated to helping our members see clearly! Offering the highest standard of optical care, National Pharmacies provides a range of services including eye testing, contact lens prescriptions, digital retinal imaging and OCT retinal scanning. As a National Pharmacies member, you are entitled to exclusive savings across a huge range of big brand frames at National Pharmacies Optical, such as Bvlgari, Gucci, Dior, Ray Ban, Oroton, Prada and many more. This includes bulk billed* member eye testing and 20% off frames, lenses, sunglasses and accessories. Come in-store today and see what’s on offer. Drakes Supermarkets are a South Australian family owned and operated business employing in excess of 6,000 employees nationally and is the largest independent retailer in Australia, specialising in supermarket retailing. At Drakes Supermarkets, we stock all the brands you know and trust, have a policy of sourcing only Australian-made produce wherever possible to support local suppliers, farmers and producers. We provide our customers with Exceptional Service, Value for Money, Great Range and an Outstanding Shopping Experience. Need an expert & reliable Conveyancer? Now that you’ve found Millard Conveyancing you’ve found the right one! Disability Services provides services for eligible adults with disability in South Australia, including: Accommodation Positive behaviour support. Community nursing, the Centre for Disability Health (CDH) and other specialist community health services became part of SA Health from 11 December 2017. Contact the Disability Information Service for general enquiries and information about disability services and support in South Australia. Liquorland is one of Australia’s largest alcohol stores, stocking a wide range of local and imported wines, beers, ciders, Champagne, spirits and premixed drinks. Liquorland, owned by Coles Supermarket since 1981 is the convenient, quick and easy solution for those who want great every day value on liquor. We have something for everybody. Fill up with quality Shell fuel or shop in-store. Located within Gawler’s Homemaker Centre, on Main North Road, Evanston, Gawler Cycles offers a wide choice of bikes for all the family. Leading brands, expert service and advice, affordable prices and many years of experience means you don’t need to travel to the city to get what you need. Check out our photos, rates, specials, links, etc and feel free to contact us. Send us your comments, a review of your bike, ask a technical question, send in a photo of you on your bike at the local park etc. We love to hear from you. ADFLEX is an industry leader in Adelaide for providing high quality Epoxy Flooring within any domestic, commercial and industrial setting. ADFLEX is South Australia’s leading service provider for concrete coating, protection and restoration, with more than 20 years’ experience in the industry. categories Industrial company We pride ourselves on: Exceptional customer satisfaction Quality products Competitive pricing Attention to detail Our professional team specialises in epoxy flooring, and protective and restorative concrete coating. If required, our service also extends to the coating and protecting of steel structures among other things. Raine & Horne Gawler specialise in property management in the northern suburbs. Through years of experience, we are able to offer our investors a comprehensive and accurate market rental expectation along with efficient and effective management of their investment properties. Not only do we offer competitive rates, we also undertake rental appraisals free of charge and strongly believe in building relationships with both tenants and investors! Now offering Property Sales, you can rely on us for effective and efficient advertising and selling of your home! Throughout the Industrial Precinct in Paxton Street, Willaston there is plenty of parking. Our Gawler clinic is located on Murray street in the Victory Square shopping complex, in the old Medicare office. There is parking available outside the front of the clinic. Hearing loss is very personal. You may start to feel that you are missing out. Or perhaps you already feel left out. But the good news is there are so many The National Hearing Care mission is to improve peoples hearing through personalised solution and exceptional client care. The core values of National Hearing Care are respect, integrity, excellence, positivity, client-driven and passion, all of which are vital to ensure that our clients receive the best hearing care possible. Whether you are a breeder, professional, family pet owner or new pet owner, you are likely to find the products you need at competitive prices at Pets Domain. Our range of products for fish, birds, dogs, cats, reptiles, rabbits, other small animals, poultry, horses and other larger animals needs to be seen to be believed! At Pets Domain, we specialise in all aspects of pet care, and are becoming a well known company within the pet industry, with 28 stores around Australia and more to come! We create professionally etched designs for a variety of personalised glass, stainless steel and wood gifts. I custom etch personalise gifts, sandblasting them by hand for a smooth professional finish (no scratchiness). Everyone’s financial situation is unique and constantly changing. Since our firm was established we have shared life’s journey with our clients, helping them to not only navigate through the taxation maze but importantly assist them achieve their dreams and reach their potential. The only way we know how to do this is by really getting to understand their needs and forming generational relationships with them. Life is full of challenges, and opportunities to be explored, and the best approach to succeeding is by having professionals on your side. Symes has developed a strong network of related experts covering all fields in legal, finance and investment. We understand that there is a solution to everyone’s challenges and opportunities to be explored every day but only if everyone’s situation is considered individually. Located conveniently in the heart of Gawler, Symes Accountants is co-located with other like-minded businesses that provide you with an integrated service covering Accounting and Tax Services, Financial Planning and Lending Services. When you choose to bank with Bendigo Bank Gawler branch you make a decision that benefits you and the community. It means you benefit from a great range of competitive products and award winning service, but also get a sense of satisfaction knowing your banking contributes to the Adelaide community. Bendigo Bank & Good for U and Your Community! The origins of our bank began more than 150 years ago in two great Australian communities, Bendigo in Victoria and Adelaide in South Australia. Bendigo Bank and Adelaide Bank each started out as building societies, driven to help Australians buy their own home. Bendigo and Adelaide Bank is now a top 60 ASX listed company, owned by more than 90,000 shareholders. We have more than 6,500 employees, who serve about 1.5 million customers in over 500 communities Australia-wide. Raven customs- we are a local, independently owned family business we tint cars, trucks, homes, offices, and specialise in tinting earthmover’s and tower cranes.We also provide security film and vandal guard for shop windows. RAVEN CUSTOMS for all your car audio, UHF, sub-boxes, dyna-mat, all can be supplied and fitted or just supplied. RAVEN CUSTOMS also do signs and graphics, stickers and vehicle panel wrap, re-trim hood-cards, alarms, auto-upholstery, airbrushing, and much more. We are located in Willaston but also have a mobile service which is available 7 days a week. Our contact hours are from 7:30am – 6:00pm for the mobile side. You must ring for a booking as we won’t make bookings through social media or via text message. Give us a call for a free no obligation quote. Fuel, coffee, food, lunches, snacks, cold drinks and much more. We have a team of professional employment consultants ready to provide you, or your business, with a range of flexible solutions to suit your needs. Improve your prospects with Job Prospects! Job Prospects is a division of SYC, a not-for-profit organisation centred on employment, training and youth services with a core purpose to positively affect the lives of people in need. Job Prospects is a leading jobactive and Disability Employment Services – Employment Support Service (DES-ESS) provider that works with jobseekers to gain and sustain employment and with employers to recruit and maintain their workforce. Job Prospects provided services to more than 47,700 people of all ages last year. Job Prospects operates from 45 sites across South Australia, Victoria and New South Wales. Job Prospects is committed to offering a quality service to assist all job seekers, including those who find it difficult to find and maintain employment. Job Prospects also offers a comprehensive and fee-free service to employers to achieve their recruitment outcomes. * Job Prospects is a provider of the Australian Government’s national employment services program, jobactive. Complete Professional Nail Care for Ladies & Gentlemen. 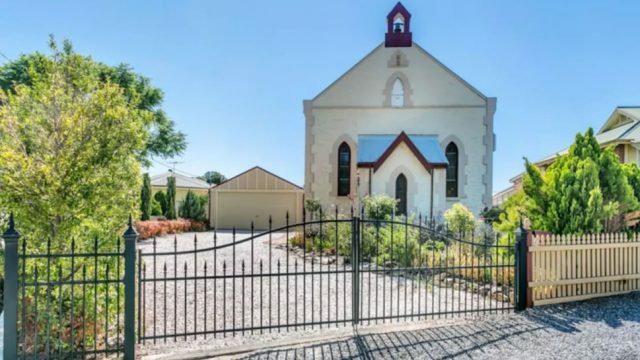 Welcome to our beautiful, self-contained home away from home, where your booking is exclusive & you can experience staying in a former church, located close to Gawler, on the doorstep of the Barossa Valley & gateway to the Clare Valley & only 1 hour’s drive from the Adelaide CBD. The space The former church is a fully self-contained 2-storey, 3 bedroom, 2 bathroom, 2 living area home with an outdoor entertaining pergola, lawned garden area & double carport. Guest access Your booking entitles you to exclusive use of the whole property for the duration of your booking. Interaction with guests THE CHURCH is yours to enjoy at your leisure. Other things to note The Visitor’s Information Centre in Gawler is located at 2 Lyndoch Road Gawler and is open Monday to Friday 9am – 5pm, Saturday, Sunday and Public Holidays 10am – 4pm and CLOSED Good Friday and Christmas Day. BWS is a convenient liquor outlet offering consumers a wide range of products. Perfect for stopping in on the way to a dinner party or on the way to watch the football, BWS offers local shoppers a convenient liquor option. BWS opened its first store in 2001 and now operates 1,300 stores across Australia. Across from the Woolworths complex, Gawler offers a large multi level carpark. Business cards, envelopes, brochures, invoice books, docket books, receipt books, flyers, leaflets, books, booklets, service cards, magnets, letterheads, folders, manuals, annual reports, photocopies, plans, posters, invitations, anything and everything on paper or card. Zambrero is Mexican with a Mission. A healthy Mexican restaurant and humanitarian enterprise committed to tackling world hunger. Since being formed in 2005 by Dr. Sam Prince, millions of meals have been provided to those living in poverty around the world through Zambrero’s Plate 4 Plate initiative. Plate 4 Plate is Zambrero’s way of providing food to those in need. For every burrito or bowl purchased, a meal is donated through distribution partner Rise Against Hunger, which distributes food to those in the developing world. The menu is bold modern Mexican with burritos, tacos, nachos and quesadillas made with fresh ingredients and fresh ideas. You’ll be sure to find what you need quickly at Bob Jane T-Marts Gawler, because Bob Jane T-Marts are Australia’s largest independent tyre retailer. Bob Jane T-Marts Gawler performs expert wheel alignment and balancing services using the latest technology, together with a huge range of wheels and tyres from the world’s leading manufacturers. When you shop with Bob Jane T-Marts Gawler, a 100% Australian owned business, you’re supporting local business and the local community. Bob Jane T-Marts Gawler is part of Australia’s largest independent tyre retailer with over 40 years’ experience, so you receive unbeatable value with professional service. Bob Jane T-Marts Gawler is right near the BP Service Station, so it’s easy to find. Established in 1991, the team at Bob Jane T-Marts Gawler is highlyexperienced and always ready to help. Whether it’s choosing new tyres, checking out the latest wheels, or stopping by for a free tyre inspection, drop in today and we will look after you. Petstop Gawler was established over 20 years ago. Trevor and Barb have been successfully managing Petstop Gawler since Feb 2007. Many changes have been made including the introduction of pets to our store. These include puppies, birds, reptiles and point of lay chooks. Our high quality fresh pet meat is delivered fresh every Wednesday but frozen meat is always on hand. Come in and visit the friendly staff at Petstop Gawler. Let us show you our new exciting range of products, pets and reptiles. Quality products and always great value for money. Open 6 days. Mechanical Repairs to all Makes & Models Brakes & Suspension are our Specialty Aus Brake and Under Car, off Paxton St, Willaston. As network specialists, Fuse goes beyond the job market to bring together ideal candidates and oppotunities, that work. With a contact list that only comes from time in the industry, we generate genuine opportunities with the people we’ve known and those, we’re known to. Our partnerships with sector leaders, and knowledge of industry movement, means getting connected faster. And our talent-driven approach to placements means finding a role that pays off for both people and business. Who we are We are Australia’s leading provider of integrated financial services and one of the most recognised brands in the Australian financial industry. Our company CommBank is Australia’s leading bank. Our financial services include retail, premium, business and institutional banking, funds management, superannuation, insurance, investment and share-broking products and services. Customer commitment We have extensive initiatives and policies in place to meet our commitment to being Australia’s most accessible bank. We are located at the Cheeky shopping centre next to Springwood Medical Centre with ample parking available outside. Diabetic Supplies Ear Piercing Giftware with Free Gift wrapping Skin Care & Beauty Products Free SMS Prescription Reminder Service Safe Prescription Holding Weekly Medicines Packaging Nutritionist in-store – Our Pharmacy values the growing relationship between diet & lifestyle and the impact this has in disease prevention & management. Our Nutritionist can help you achieve optimal health & feel your best. Prescriptions & Medicines Free Local Home Delivery Free Blood Pressure Monitoring – Blood pressure is known to increase risk of heart & kidney disease. It has no warning signs and symptoms even at dangerously high readings. Gawler East Pharmacy offers a free blood pressure check. At Lewis & Shane, we care about our clients. We pride ourselves in providing clear, friendly advice and achieving the best outcome for our clients. Lewis & Shane has a simple philosophy: “Understand your clients – take the time to listen and provide timely advice that is relevant and practical to each client’s needs.” What sets Lewis & Shane apart from other law firms is:- Our accessibility Our desire to build strong relationships with our clients Our proactive response to each client’s needs We are honest about what we can do and transparent about what we are doing Our performance is monitored against our client’s objectives. We provide legal services to individuals, businesses and local community groups in the Barossa, Light, Gawler and surrounding districts. We regularly attend at offices in Kapunda and Nuriootpa and can visit our clients at their home or business premises. Our Gawler South office is conveniently located with plenty of car parking. There are no stairs therefore our office provides ease of access for elderly and handicapped clients. Parking here, opposite the cinema. Supercheap Auto is one of Australasia’s leading retailers of automotive spare parts, hand tools, power tools, car care, electrical, outdoor products, and more. Avoid the cowboys and find an honest supplier to provide a good, reliable service at a fair price. The kitchen tap needs fixing, maybe it’s time to do some redecorating, a new shower would be nice and the roof could do with some patching up. Now the headache starts, family and friends can’t recommend anyone, and everyone is giving you their shonky tradie stories. Turning to the local paper or google probably isn’t going to help either. The most common complaints we hear about tradesmen are that they don’t show up on time, don’t return quotes, or the work doesn’t meet expectations. “Connecting with trusted tradies and businesses is like having a good GP: you will be happy to recommend them to others”. Chicque & Co. is not just about being able to buy the latest styles and trends in women’s fashion, we also provide a Dress Hire service and Consignment for those who want to make money. We also Hire clothing Sick and tired of paying for clothes that just end up sitting in the closet? How about booking an appointment to hire a range of dresses for those special occasions. Or make money by hiring out your own clothing. What is the Gawler Business Development Group? The objective and purposes of the Gawler Business Development Group are to promote and market the business of the Town of Gawler, provide business training to members, and to represent the interests of the business community. How do I become a business member of the Gawler Business Development Group? If you operate a business in commercial premises in Evanston, Gawler or Willaston, you are a member of the GBDG via the levy paid as part of your property's council rates. If you are a mobile business or home-based business you can join the GBDG via an annual fee. Get in touch with us to learn more. Who runs the Gawler Business Development Group? The GBDG board consists of 7 to 13 local business owners, who represent the interest of approximately 450 businesses commercial premise, home-based and mobile businesses.